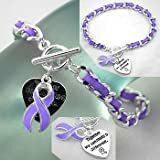 Purple Ribbon Awareness Bracelet. ~ [PLEASE NOTE: Awareness fashion jewelry is mass produced and may have slight imperfections.] ~ **************The following is a list of awareness causes the Purple Ribbon is used for: ADD - ADHD - Alzheimer's Disease - Animal Abuse - Anti-Violence - Arnold Chiari Malformation - Colitis - Crohn's Disease - Cystic Fibrosis - Domestic Violence - Epilepsy - Fibromyalgia - Fibromyalgia (Men) - Harmony - Homelessness - Leimyosarcoma - Lupus - Macular Degeneration - Mucolipidoses - Mucopolysaccharidosis - No Unattended Kids in Cars - Pancreatic Cancer - Pancreatitis (Chronic) - Religious Tolerance - Sarcoidosis - Sjogren's Syndrome - Thyroid Cancer . This purple ribbon bracelet is very pretty. It has circle charms with purple beads inside the circles. Has a silver ribbon charm. Great if you want the purple ribbon awareness to be subtle. 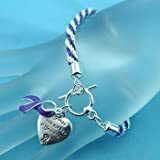 This purple ribbon bracelet has a high quality feel and everyone will want one. The bracelets are 8 inches wide and have elastic so they stretch to fit any size wrist. Each bracelet comes in a gift box with cotton insert.